New Winter 2018: A poignant scene is captured in this simple yet profound sculpture that has been produced as a Christmas ornament for the Russell Rhodes collection. The angel's embrace Christmas ornament from noted artist Susan Lordi depicts an angel, perhaps the child's guardian angel, holding a child lovingly and securely. When selected for parents, it is a reminder that their children receive special care and attention from above. It makes a wonderful first Christmas ornament. 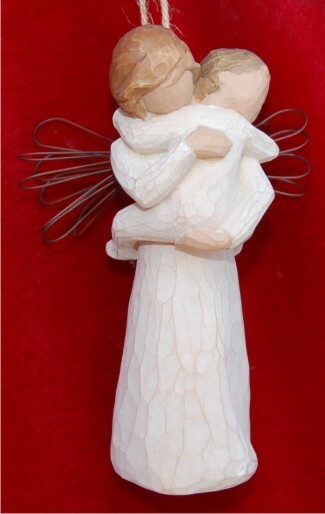 This angel ornament is also chosen as a memorial ornament for a young child, giving comfort to the bereaved. The piece is made from quality resin and includes cording for display. Choose a reminder that will bring comfort and assurance, the angel and child Christmas ornament for your tree or for friends. Christmas Gift/Family Tradition Dec 21, 2017 MaryAnn F.